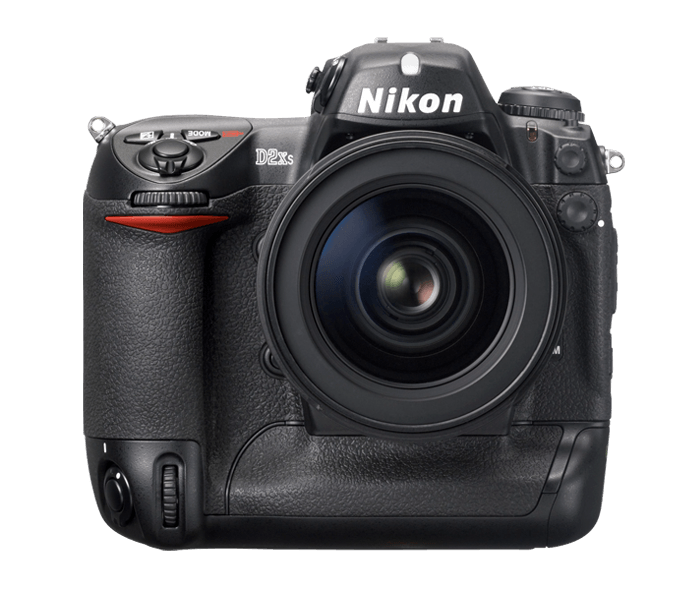 12.4 effective-megapixel Nikon DX format CMOS sensor: The CMOS image sensor provides both high image quality and high-speed performance at up to 5 fps. And despite the extremely high resolution achieved by 12.4 effective-megapixels, image data is recorded at exceptionally high speed through use of a 4-channel output method. Next generation colour reproduction: Nikon’s most powerful image processing to-date delivers colour images that are both natural and accurate, delivering true-to-life colour reproduction and realistic transitions. Powerful image processing engine designed to produce high-quality images: Significantly higher quality images are a prerequisite today. But with Nikon, high image quality is so much more than just megapixels. In fact, there's a plethora of other high-level technologies required to achieve outstandingly high levels of performance that today’s photographers need which is exactly what the D2X provides. High-speed crop function with new automatic mask feature: Continuous shooting at a rapid 8 frames per second is possible when using the high-speed crop mode that records the central portion of the frame at 6.8-megapixel resolution. What’s more, the viewfinder has been enhanced to provide an automatic mask that is activated when the HSC mode is set for simpler accuracy in composition. 1,005-pixel 3D Colour Matrix Metering II: Nikon's exclusive light metering technology intelligently evaluates numerous elements beyond simple brightness and compares its findings against an onboard database of reference images. Complex and otherwise time-consuming, exposures are determined instantly, resulting in consistent and dependable digital imaging exposures. The advantages of 3D Colour Matrix Metering II are provided in the high-speed crop function which also optimizes the areas calculated for using center-weighted metering and i-TTL flash control. Sharp, clear 2.5-inch TFT LCD display with a 170-degree wide-angle viewing: The D2X incorporates a large 2.5-inch 230,000-dot, high-resolution LCD monitor display with an ultra-wide 170-degree viewing angle for clearer viewing. It also offers larger type fonts that improve access to colour-coded menus. 11-area AF system with 9 cross-type AF sensors: Updated to perform even faster and with greater precision in the D2Xs, the 11-area AF system employs Nikon's advanced Multi-CAM 2000 AF Sensor Module. Of these 11 widely spread AF sensors, 9 are cross-type sensors positioned in the logical rule-of-thirds array. All 9 cross-type sensors remain active when using high-speed crop mode. Broad colour mode options: Adobe RGB profile (colour mode I and II), as well as the option of the sRGB profile enables photographers to set the best colour mode based on their shooting needs. Additionally, a new black and white capture mode is now available. Image overlay and multiple exposure: The multiple exposure function creates a single image from up to 10 exposures. The D2X also offers an image overlay function that merges selected RAW (NEF) files already stored on the CF card to create a new image file within the camera. World's fastest response with a 37ms shutter release time: Instant startup and a class-leading shutter release time lag of a mere 37 milliseconds combined with optimized systems throughout maximizing all-round performance, delivers the response needed to handle even the most challenging professional assignments. Creative in-camera trimming: A newly added feature, in-camera trimming, allows RAW, TIFF and JPEG images taken using the D2X to be trimmed within the camera producing images of reduced display sizes ranging from 640 x 480 to 2560 x 1920 pixels. Full integration into Nikon’s Creative Lighting System: When used in combination with SB-800, SB-600 or SB-R200 Speedlights, the D2X supports Nikon’s Creative Lighting System with high-precision flash photography using i-TTL flash control, giving unlimited creativity through Advanced Wireless Lighting and functions such as FV Lock and Auto FP High-Speed Sync. Lithium-ion battery system with even greater power: The new EN-EL4a rechargeable lithium-ion battery, retains the same form, but features significantly increased capacity that delivers enough power for up to 3,400 shots per charge. The system’s real-time status display gives accurate feedback on the percentage of remaining battery charge, the number of shots taken since the last charge, the overall status of service life as well as notification when calibration is recommended. Support for Capture NX: Capture NX offers the exciting potential for Nikon Electronic Format (NEF) files, JPEG and TIFF images. Refined through revolutionary U-Point technology, it greatly simplifies the selection of objects, colours and areas supporting highly accurate alterations to a myriad of image elements while also preserving the integrity of the original image data. GPS support: With the optional MC-35 GPS adapter cord, location information such as latitude, longitude, altitude and heading (direction) can be transferred from a GPS device and then recorded along with the shooting data for each image. Wireless support with the Wireless Transmitter WT-2/2A: The D2X supports the new high-speed, IEEE802.11b/g compatible Wireless Transmitter WT-2A with enhanced image transfer protocols and increased security. The WT-2A additionally supports the new PTP/IP protocol. And when used with optional Camera Control Pro software, wireless camera control is possible.